PetConnect Rescue Featured in Animal Planet's Dog Bowl 2, Sunday Feb. 3! "WOOF! WOOF! BARK! BARK! WOOF! WOOF!" "HISS! What in paws has got you so excited Noah! Is there a deer in the backyard again?" "No! WOOF! Almost better than that Samson!" "What could be better than deer meat for breakfast, lunch or dinner? Meow?" "My friends at PetConnect Rescue will be featured on Animal Planet's Dog Bowl 2" on Sunday night, February 3, at 3:00 p.m. EST on Animal Planet! PetConnect Rescue is the rescue who rescued me around 11 years ago. They found me in North Carolina and through Pilots 'n' Paws brought to Maryland where I found my humans to love and a pawsome 'Forever Home!" "MEOW! Yes, I remember you sharing with me about PetConnect Rescue but what about the Dog Bowl 2?" "Barkly, PetConnect Rescue is woofingly thrilled to bark about having two players in this year's Dog Bowl 2! The Dog Bowl is returning for its second year! Pawingly, this canine driven football competition is created for adult dogs living in rescues and shelters who are frequently looked over for puppies. The one-hour special is hosted by the award-winning animal advocate, Jill Rappaport!" "MEOWS! Purr! Really cool Noah!" Barks, the Dog Bowl will be paired with the pawsomely ever-popular Puppy Bowl and aired during the "Road to Puppy Bowl" on Saturday, February 2 at 8 PM ET/PT before the big event: PUPPY BOWL XV! There are 63 dogs from 31 shelters across 15 states participating! Paws, including the number of pups participating, there are over 150 adoptable dogs and puppies featured in PUPPY BOWL and DOG BOWL in 2019! WOOF! The dogs in DOG BOWL range in ages from 2-16 years old and include a variety of breeds and mixed breed from a Cocker Spaniel, Pug, German Shepherd, Basset Hound, Pomeranian, Chihuahua, Bulldog, Pekingese, Boxer, American Eskimo, and many others! WOOF! 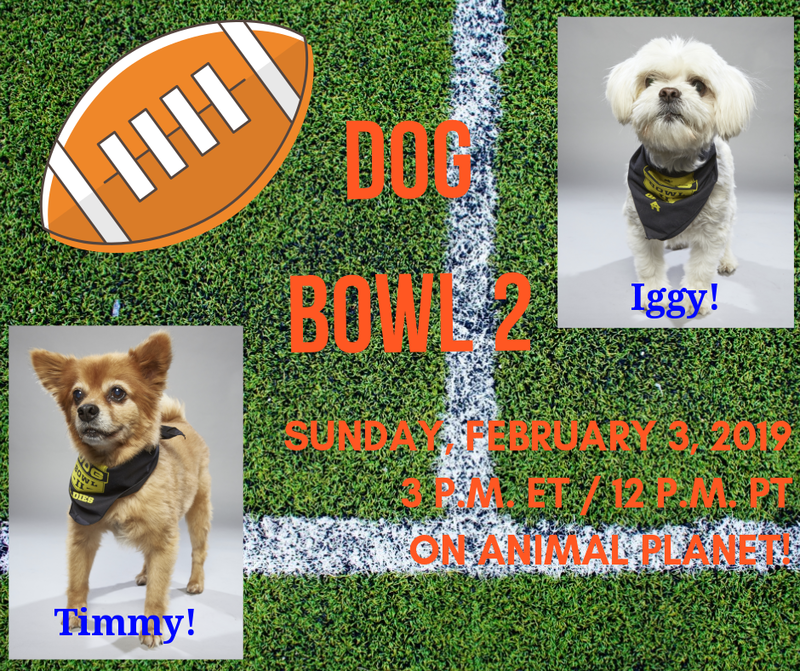 From my friends at PetConnect Rescue, Iggy and Timmy will storm the gridiron making their mostest cutest-ever ear pulls and tail wags as part of Team Oldie as they compete to win the day and your hearts! Barks, Iggy, a 5-year-old Shih Tzu mix, came to PetConnect Rescue on a Pilots 'N Paws flight all the way from North Carolina too. He's a fluffy bundle of energy who loves nothing more than chasing balls, Iggy was a natural for the Dog Bowl! Always focused on the win, he was happily adopted out to a loving couple soon after filming. His thrilled owners make sure Iggy’s retirement from Dog Bowl fame features time chasing toys and playing with his canine brother. Paws, Timmy is PetConnect Rescue’s other Dog Bowl 2 participant! WOOF, he s the spryest 14-year-old Pomeranian mix you’ll ever see! He came to PetConnect Rescue when his owner entered an assisted living facility. Timmy is a standout on the field with his beautiful red coat and independent streak. He’s still waiting for his forever home but, in the meantime, he's happy to be part of PetConnect Rescue's senior dog program where he spends his days frolicking in a big yard and regaling his canine friends with tales (and tails) of his adventures in New York! WOOF! Barks, be sure to tune in on Sunday, February 3, Sunday, February 3rd, at 3:00pm ET/12:00pm PT on Animal Planet. For 14 years, Animal Planet's Puppy Bowl has owned the world’s cutest sporting event on television! WOOF! BARKS! This year marks the second DOG BOWL as well! Every Super Bowl Sunday, Dog Bowl barkers representing rescues and shelters from across the country compete in adorable team plays that will hopefully lead to finding their "Forever Homes." "Meow, HISS! What treats will you be serving while we watch the Dog Bowl 2, Noah?" PetConnect Rescue is a 501(c)(3) foster-based animal rescue organization dedicated to saving dogs and cats at high risk of euthanasia. Our compassionate volunteers and staff find loving homes for all the animals that come into our care and provide ongoing support throughout the adoption process and beyond. We are committed to ensuring a highly positive rescue experience for our adopters and to raising awareness of the plight of abandoned animals through community education. For more information, go to www.petconnectrescue.org. Animal Planet's mission is to create high-quality content to keep the childhood joy and wonder of animals alive by bringing people up close in every way. Animal Planet combines content that explores the undeniable bonds forged between animals and humans. For more information, please visit www.animalplanet.com!